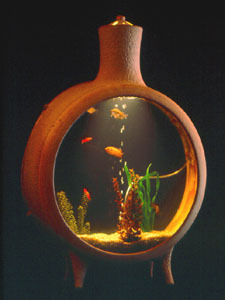 Robert began making his Stoneware Aquariums in the early 1970s. The following images and text explain his techniques for making these unique pieces. 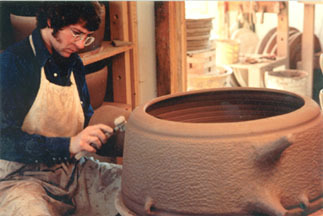 Robert made his own "over sized" bats to go on to his Shimpo potter's wheel. In this image he is lowering the bat on to the pinned wheel head. An oversized bat is placed onto the wheel. 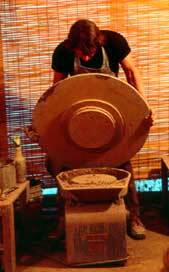 Putting 110 pounds of clay on to the wheel. 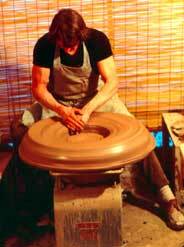 110 pounds of soft plastic clay is dropped on the wheel, as close to center as possible. 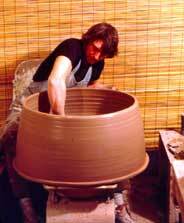 Using his body weight, Robert works the clay out to the desired diameter and leaves the suggestion of a well. Positioning clay with his feet. Beginning to form the aquarium. 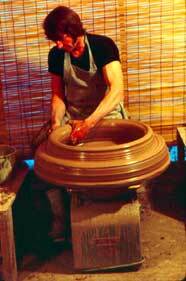 Soft clay makes it possible to center and open the form. 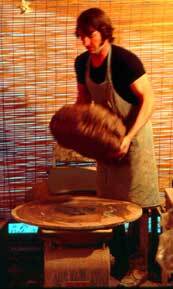 The Shimpo wheel can stall under the weight, if too much pressure is applied. Bringing the form out is the most stressful part, using his right arm as a pivot point on his right leg, helps when strength is not sufficient. Throwing the piece is not as difficult as trimming the “galley”, where the glass sits. In order to trim the form it must be flipped over on to its rim, while still leather hard. The front viewing port on the aquarium (the top) is turned back on itself to create a flat receiver, where the glass will be attached. Legs are added as thick pugs, then the pugs are carved to shape. 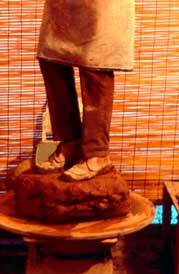 Once the neck is added to the body, legs are attached and the whole form is textured. 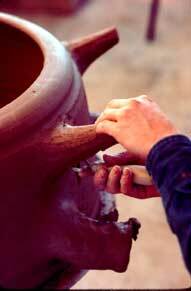 The exterior of these pieces are left unglazed, however, a line glaze is applied to insure a water tight finish. 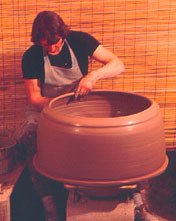 Aquariums are thrown on the wheel with using between 30 to 110 pounds of clay. A thick wall is necessary for long strength and durability. 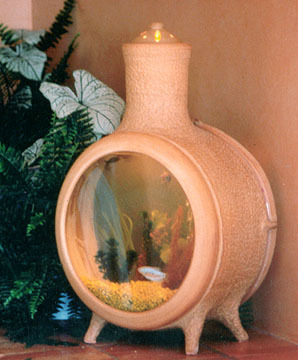 Robert has been making Fountains and Aquariums since 1973.